Exeter secured a record seventh straight bonus-point win in the Premiership, running in six tries to ease past Northampton and move level on points with leaders Wasps. JJ Hanrahan's try put Saints ahead but Don Armand and Olly Woodburn scored either side of Ken Pisi's yellow card. Ian Whitten, Jack Nowell, Sam Hill and Woodburn all scored second-half tries as Exeter's dominance finally told. Ahsee Tuala went over in the corner for a last-gasp Northampton consolation. Victory for Rob Baxter's side at Gloucester on the final day of the regular season on 6 May will guarantee them a home play-off semi-final, while they could yet finish top of the table. Wasps are home to Saracens on the same day. Northampton, meanwhile, are three points behind sixth-placed Harlequins, with European Champions Cup qualification now out of their hands. They are home to Harlequins in their final league game. They were forced into a late change, skipper Tom Wood out with a shoulder injury, while England and Lions man Courtney Lawes was forced off with a head injury. Samoa wing Pisi was sin-binned after being adjudged to have knocked-on deliberately with Exeter on the attack. 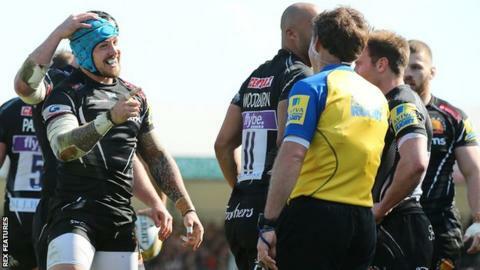 Nowell had a try chalked off in the first half but the Lions call-up was rewarded for a fine performance when he touched down after being bundled over in the corner. Exeter assistant coach Ali Hepher said: "We left some tries out there, but we are pleased with the way the guys kept coming, which was the mental attitude we needed. "Yes, we have been winning with bonus points, but we hadn't been performing right at our top, but today was getting towards it. "The last few weeks have been tough for Jack Nowell. Coming out of the Six Nations has been a real tough one through conditioning and the mental pressures as well, so he has just been a little bit off himself, and he admitted that. "He showed why he has been selected for this Lions tour, and why he should be going as well." Northampton director of rugby Jim Mallinder said: "I thought we were well beaten today. "Over the last few weeks we've competed well against some of the top sides, but right from the start today Exeter looked after the ball and were very physical. "I thought we defended quite well, but it took its toll, and it took its toll in attack because whenever we did get the ball we just couldn't keep hold of it and didn't have that physicality needed to break down their defence." Exeter: Turner; Nowell, Whitten, Devoto, Woodburn; Steenson, Townsend; Rimmer, Yeandle (capt), Holmes, Dennis, Parling, Ewers, Armand, Horstmann. Replacements: Cowan-Dickie, Moon, Williams, Atkins, Salvi, Chudley, Simmonds, Hill. Northampton: Tuala; Pisi, Burrell, Mallinder, Foden; Hanrahan, Groom; Waller, Hartley (capt), Brookes, Day, Ribbans, Gibson, Lawes, Harrison. Replacements: Haywood, Ma'afu, Denman, Ratuniyarawa, Dickinson, Dickson, Tuitavake, Estelles.